It’s a sunny NW summer morning, and everyone is still asleep in my house. 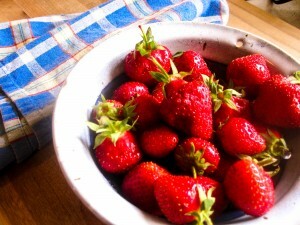 The sweet smell of strawberries are coming from my kitchen. While we were running errands yesterday, I saw a stand that said ” fresh local berries”. I quickly did a U turn and pulled into the parking lot. Local strawberries are so sweet, and little, and full of flavor….. There’s nothing in comparison, not those ginormous, hollowed out, flavorless ones the grocery store brings out in early spring from some other far away state…oh no, the local berries are the BEST! I love eating these bright red berries plain, but sometimes when you soak ’em in a little Grand Marnier, they bring out an amazing flavor, and the juices start flowing from these berries! 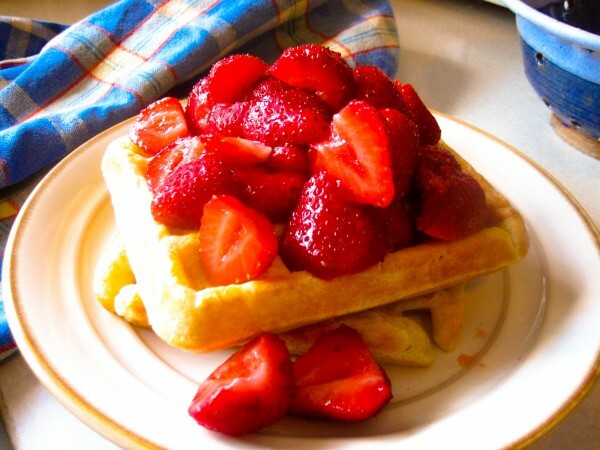 So today’s summer morning calls for strawberry waffles! They are my daughters favorite! She would eat waffles for every meal if I let her. My sweetie taught me the “trick” to great waffles. There’s nothing worse than a soggy waffle that won’t hold up to syrup or fruit juices. I love my waffles solid with a crunch, ones that won’t get soggy before all are eaten! A little melted butter, egg whites, flour, salt, baking powder, milk, vanilla, and egg yolks make these waffles into breakfast favorites! The secret is separating out the egg whites and yolks. 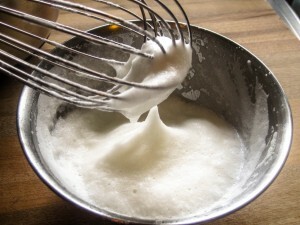 Then whipping the egg whites to stiff peeks, and lastly “fold” the whites into the mix at the very end. I believe that makes all the difference! The whites should cling to the wisk and appear “stiff”. If your whites are still runny, whip ’em some more! You will have amazing forearms within no time! Wash strawberries and pull stems off. Slice in half and put into a small bowl. Pour a splash of Grand Marnier on strawberries and let soak for 10 mins. I used about 2 tablespoons on 1 pint. 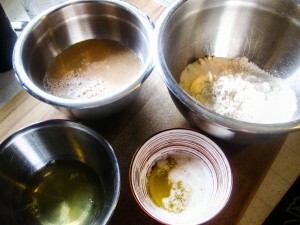 Mix in a medium bowl, flour, sugar, salt and baking powder. In a separate bowl, mix the vanilla, egg yolk, melted butter and milk. Make sure your melted butter is cooled to room temperature before adding to the mix. Then fold wet into dry mix. Next, whip the egg white until really stiff. It should “hold” on the whisk, if not, whip more. Fold the egg white into the batter until combined. Pour into a heated waffle iron, cook until steam disappears and waffles are brown. Top with strawberries and enjoy!